The last two weeks of July were spent up in Caithness, carrying out repeat monitoring of Plantlife’s Munsary Peatlands Reserve. The monitoring of the reserve is undertaken on a 7-year cycle. We established the baseline in 2002, then undertook the first cycle of repeat monitoring in 2009. Consequently 2016 represented the second cycle of monitoring. The second cycle is exciting because this gives three points on the curve of trends, giving a clearer picture of where the site is going in response to Plantlife’s management of the reserve. Plantlife’s Munsary Peatlands Reserve lies less than 30 miles south, by road, of both John o’ Groats and Dunnet Head – the latter being the true location of the most northerly point on the British mainland. The reserve itself is located down a very long and very difficult track which begins a little way off the A9 some 20 miles south of Thurso, the County Town of Caithness and itself located on the north coast. A ‘robust 4×4 vehicle’ is the only sensible way down the track, which is in any case not generally open to visitors, so we hired a long wheelbase Land Rover Defender for the two weeks. The two-day journey north from London felt, as it always does with a Land Rover because of the large all-terrain tyres, rather like riding a slightly skittish horse that needs to be constantly encouraged back to the correct route, so it was a relief to arrive at ‘Northern Lights‘, the self-catering cottage overlooking Scrabster and Thurso, which was to be our base for the next two weeks. We were undertaking the work in partnership with the Environmental Research Institute (ERI) of the University of the Highlands and Islands (UHI), so our first day out at Munsary Cottage in the middle of the reserve saw us assembling the equipment needed for a training and standardisation day with everyone to ensure that we would all be recording in the same way over the coming days. The UEL team consisted of myself, Jack Clough (Research Assistant), Jerushah Jardine (PhD student), John Riggall (former NCC Peatland Team colleague) and Sam Jelliman (taking a break from Sustrans), while the UHI team consisted of Roxane Andersen (ERI Research Fellow), Pete Gilbert (ERI Technician), Nathalie Triches (an ERI intern student from Switzerland) and Gearoid Murphy (taking a short break from the RSPB). That night all hell broke loose, with thunder, lightning and tremendous deluges of rain. 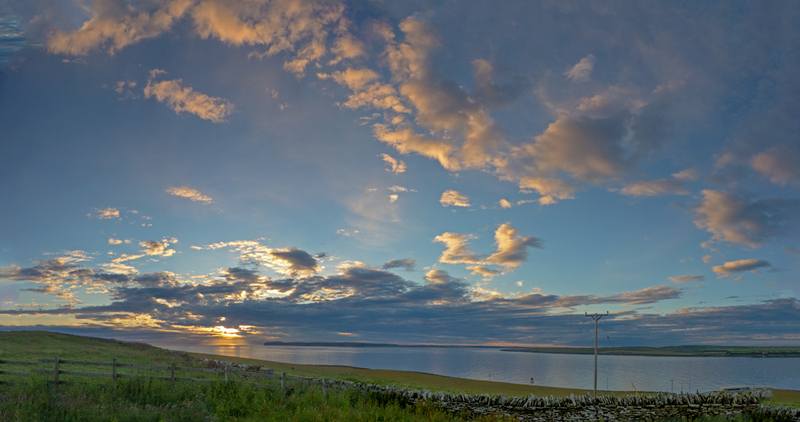 The wifi in our cottage was completely fried by one particularly spectacular bolt of lighting about 2 a.m., although by all accounts things were even worse further south in Scotland. Having negotiated the cattle, we arrived at Munsary Cottage to the increasingly loud rumbles of thunder. Heading off towards the main Munsary pool system and carrying large metal rods, metal camp-beds and metal detectors, we became increasingly dismayed as the thunder headed slowly but surely towards us. By the time we’d arrived at our transects the rain was coming down in monsoon quantities, almost making it difficult to breathe, and then the lightning started flashing down all around our own horizon. I tried calling up the other two teams on the radios to suggest we consider abandoning things, but there was so much static and rain noise that we just couldn’t hear each other and besides the long walk back was likely to be just as dangerous as remaining where we were. 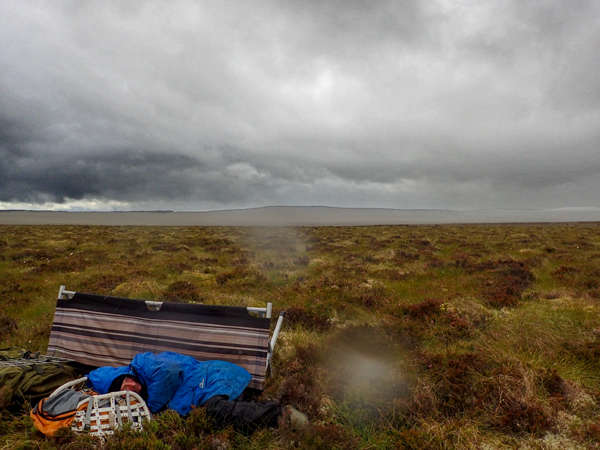 A double bolt of lighting hitting the wind turbines not far from where John’s team was working led him, wisely, to suggest that his team lie down in the heather for a while – a suggestion which his team members adopted immediately and with some enthusiasm. The other two teams were in such a wet area that lying down wasn’t an option – unless team members preferred drowning to being struck by lightning. Still, we were all wearing rubber waders, we kept some distance from the metal equipment for a while, and the lightning never approached nearer than a mile or two, so we just worked steadily on through the storm and eventually it became bored and drifted away to cause mayhem and excitement elsewhere.